Thoughts about the markets, automated trading algorithms, technical analysis, and lots of other stuff. Thanksgiving is a holiday where we're encouraged to feel thankful for all the bounties in our life – and to appreciate those around us. I enjoyed spending time with my kids, watching the Cowboys win, and eating too much. That's a great start; but, feeling thankful is different that being thankful. Think of it as the difference between passive voice and active living. It reminds me of an idea called "Tikkun Olam" (or – healing the world). Even if you're not Jewish, I think we can all agree the world needs a little of that. For example, instead of just feeling thankful, what could you do to make the life of someone around you better? Likewise, how can you let others know that you're thankful for them? Transformational change is often easier than incremental change (because you don't have to drag the past forward). So, what can you do that would trigger 10X results? Will you? Got this from a friend and thought it was funny. Experts have found the following analysis to be nearly 100% accurate. The Washington Post is read by people who think they run the country. The New York Times is read by people who think they should run the country, and who are very good at crossword puzzles. USA Today is read by people who think they ought to run the country but don't really understand The New York Times. The Los Angeles Times is read by people who wouldn't mind running the country, if they could find the time and if they didn't have to leave Southern California to do it. The Boston Globe is read by people whose parents used to run the country. The New York Daily News is read by people who aren't too sure who's running the country and don't really care as long as they can get a seat on the train. The New York Post is read by people who don't care who is running the country as long as they do something really scandalous, preferably while intoxicated. The Chicago Tribune is read by people that are in prison that used to run the state, & would like to do so again, as would their constituents that are currently free on bail. The Miami Herald is read by people who are running another country, but need the baseball scores. The San Francisco Chronicle is read by people who aren't sure if there is a country or that anyone is running it; but if so, they oppose all that they stand for. There are occasional exceptions if the leaders are gay, handicapped, minority, feminist, atheists, and those who also happen to be illegal aliens from any other country or galaxy, provided of course, that they are not Republicans. The National Enquirer is read by people trapped in line at the grocery store. The Seattle Times is read by people who have recently caught a fish and need something to wrap it in. In this environment, the news can be harder to believe than fiction. Here are some of the posts that caught my eye. Hope you find something interesting. This Thanksgiving, my son Zach made a stupid bet with himself – that he could gain 10 pounds in one day. His mom and I both tried to tell him not to do it; but we forgot a golden rule: Never tell a Getson they can't do something. The image speaks for itself. He gained over 13 pounds. Even considering the weight normally gained on a Thanksgiving, that's "disgusticating" (worthy of a made-up word). Hope you enjoyed your holiday too! Dak Versus Tony: A Meritocracy? The Dallas Cowboys are 9-1 this year (a feat entirely unexpected after an early injury by Tony Romo in the preseason). I recently talked about going to a Cowboys practice, and how impressed I was with the attention to detail and precision they displayed. Tony Romo's recent "concession speech" to rookie QB Dak Prescott is worth watching ... Interesting, nuanced, and deep. Romo covers his feelings of sadness and regret over his injuries, and addresses his position on the team, and acknowledges that Prescott has earned the right to "his spot." You see football is a meritocracy. You aren't handed anything. You earn everything. Every single day, over and over again. You have to prove it. That's the way the NFL, that football works; you have to prove it. There's a lot to learn from Romo's speech about humility, about putting others before you, and being a team player ... Oh, and also about meritocracy. The deck isn't always fair, but if you work harder and smarter than those around you, there's often a light at the end of the tunnel. It's a reminder that you can't rest on your laurels. "Every single day, over and over again." winning is a habit, and you win with the time you put in before you ever step on a field. Unhappy people find a way to be unhappy; losers find a way to lose – and winners find a way to win. If you're standing still, you're moving backwards ... Here is to moving forwards. As Trump's Presidency starts, I thought it made sense to get an overview of alternative investment options. That reminded me of something else I'd seen recently ... Check out this Periodic Table of Elements that shows what they're commonly used for. Pretty interesting – It gives you some insight into what it takes to keep the world running. If you ask nicely, perhaps they'll name an element after you? The election was very interesting to me. While Hillary Clinton deftly followed the wisdom of Napoleon: “Never interfere with the enemy when he is in the process of destroying himself.” It didn't work. I believe Trump’s success is a direct result of a broader collective dissatisfaction and negative mood trend in America. As unlikely as the outcome was, socioeconomics explains it well. Socionomics is the study of how social mood motivates social actions. It studies how waves of social mood regulate changes in social behavior, including changes in the economy, political preferences, financial markets and popular culture. Last year, if you told me 2016 would be the year that: the Cubs would win the world series, a reality TV show host would be president, and Britain would leave the EU, I'd have assumed you were on drugs. Even three months ago I would have been surprised. Last week, MogIA, an AI, predicted that Donald Trump would win, making it 4 for 4. If you had been tracking the polls, that would have felt ridiculous, but computers can be more objective than you or me. Trump's campaign was a polarizing affair, with massive backlash from liberals, and a mainstream media which almost completely missed the momentum Trump had. There're massive parallels between the way the media reported this campaign, and what happened with Brexit. The media echo chamber was pro-Clinton and ended up ignoring the feelings of a large group of voters. In Britain it was the elderly ... in America, it was working-class white people. 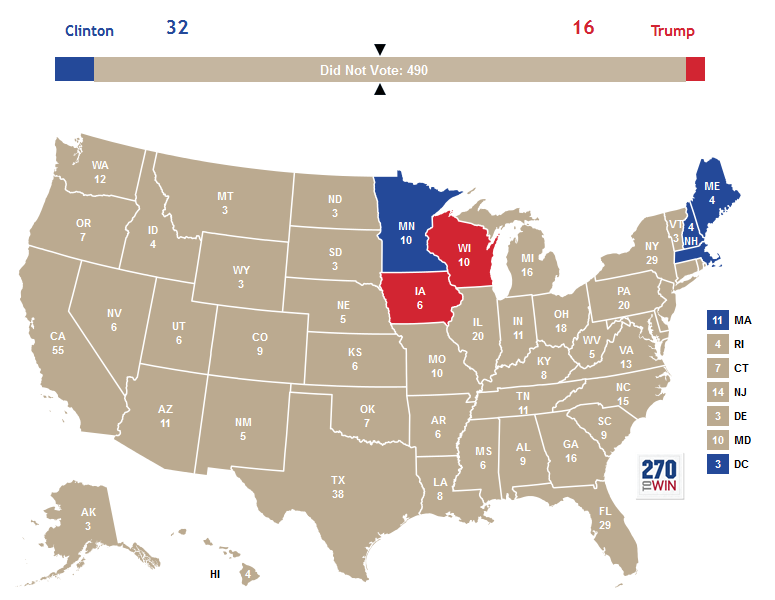 Trump won swing states like Pennsylvania and Michigan in large part due to those voters feeling ignored and attacked by Clinton. Coal and Gas are their livelihoods, and efforts towards clean renewable energy could leave them jobless. If "Did Not Vote" was a candidate, they would have won by a landslide. But, people did vote – and the result is change. So, what do you think the effect will be on America and our stock market, long term under Trump? Leading into the final days of the election, you can see a steep drop in markets. Uncertainty often has that effect on a market, but since Trump's election, there's been a rebound. In fact, the Dow Jones Industrial Average was able to set an all-time high. As well, Putin has expressed interest in restoring ties with the U.S. It will be interesting to see the effects of this on the geopolitical environment. If there's anything to learn from this experience, it's that trying to time the market is dangerous, and that ignoring dissidents makes you out of touch and vulnerable. On a lighter note, here's the President-elect, Donald Trump, wrestling at Wrestlemania 23. He's a regular Ronald Reagan. I've been sent this by a couple people. Thought it was funny. What do you think the aftermath will be for Hillary? As the country enters its decision zone, the S&P 500 Index is at one too. Here is a chart that shows we are at a major support-resistance zone. We just saw a long string of down days. U.S. stocks just posted their longest slide since 1980 (nine straight days). Regardless of what happens here, I expect volatility. Well, the Election Season is almost over! It has been a crazy last few weeks. Who do you think will win? More importantly, what do you expect to happen? Believe Nothing and Trust No One ... April Fools!